What’s the story behind Ministry of Talent? Name, origin story and the whole shebang. The Ministry of Talent was born in 2012 after we identified a need in the market for digital talent management. I was taking care of the PR for a few key social media influencers via my PR agency Sweaty Betty and began to notice that they were being inundated with gifts from businesses hoping that they would post on their Instagram feeds to their hundreds of thousands of followers. Instagram was really starting to blow up and businesses were starting to take notice of the power of social mediaI. It was then that I identified a real need for talent management, working to negotiate paid posting & larger commercial deals for talent rather than simple gift-for-post deals that had been the standard in the past. What led you into the influencer management business? It seemed to be a natural progression from having worked in PR for over a decade, I was already familiar with social media and it’s power as a platform for brands, having utilised it with my clients on the Sweaty Betty PR side. It’s an exceptionally new industry, some people would argue you’ve defined in the Australian Market. How has it shaped since you first began? One of the key differences I have noticed with the progression of this industry is the saturation of influencers who are actively promoting brands on their social channels in a paid capacity. I think this speaks volumes to the sheer level of demand for social media promotion – it’s no longer the exception for brands but rather a key aspect of their PR & Marketing plan. It’s fantastic to see brands putting such a high value on the opinions of influencers who have a much more specialised focus on one certain area of interest such as fashion, lifestyle, beauty or health etc. What’s your education background? Was it a seamless transition to the business you’re managing now or a complete career change? I’ve always been a worker, since my first job at 14 years old at Drummoyne McDonald’s. I wasn’t always the best student at school but I had grit and a determination to succeed and build something myself, that’s how my first agency Sweaty Betty PR came about. Were there any major influences that led you to compete in the influencer/social media market? The biggest influence for me was definitely the market demand. As THE MINISTRY OF TALENT was the first agency of it’s kind, the competition element wasn’t really a factor at that stage. We were driven by demand and the sheer volume of interest by clients in this new style of promotion which hadn’t really been widely explored as a commercial asset in Australia up until that point. Who did Ministry of Talent start off targeting and how have you expanded your reach? At the start I would have to say that the fashion industry was definitely the most adoptive and flexible in terms of embracing the idea of paid social media content. Brands had already seen the value of alignments with key digital influencers having sent products over in the past which featured on the talent’s social media accounts and sold out the next day due to follower interest. We really looked to work with whatever way the market was moving and as the power of social media grew, more industries came on board. 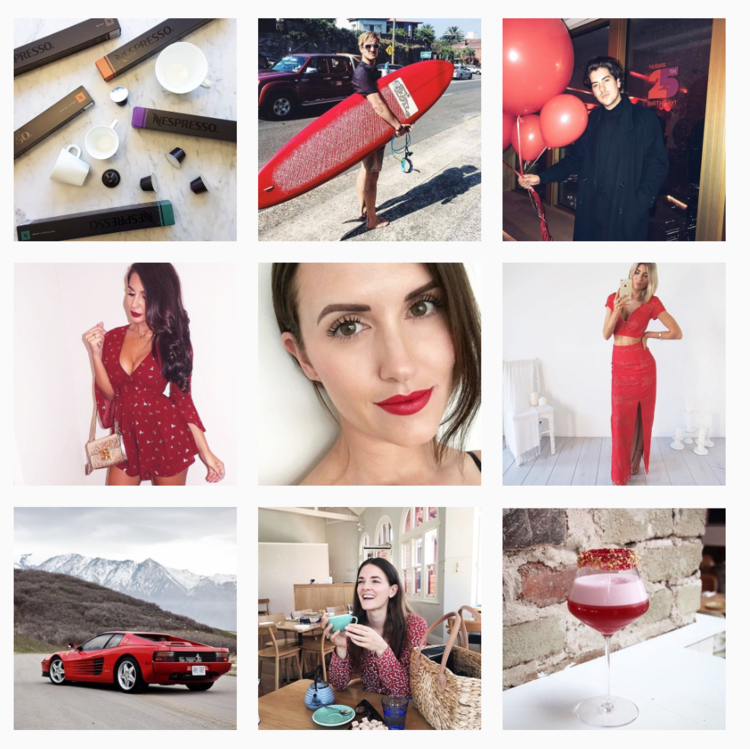 THE MINISTRY OF TALENT now boasts a roster of over 55 different digital influencers ranging across the fashion, lifestyle, beauty, health & fitness, food, mens, kids & travel space. What’s the mission that dictates Ministry of Talent’s company ethos? We like to work smart and fast. We’ve seen in this industry that if you’re too slow in your response times, that the opportunity will go to another talent – the market is so saturated with talent that you need to make sure that you are the first responder! However, in saying that, it’s equally important that the alignment is sound, we’ve seen too many cases of talent who have posted on anything and everything and their channels ultimately plateau because their followers disengage. Social media can be extremely invasive. What protocols do you have in place for yourself and your clients to ensure that a level of privacy and division between work and personal life exists? With our influencers, we really leave it up to their discretion. At the end of the day, it is their channel and they are free to post what they wish. However, we do encourage our talent to ensure that their feeds stay on brand for them. For example, It wouldn’t make sense if a female fitness influencer began posting on the newest hamburger restaurant as it’s completely off brand. Your branding is phenomenal and highly coordinated and creative. What’s the design process you follow to ensure your talent and self are well represented through your various channels? Again, for THE MINISTRY OF TALENT, it’s all about quality and relevant content. It’s also important to post regularly and maintain your feed’s aesthetic. For example, with THE MINISTRY OF TALENT Instagram account, all our posts are arranged in order of colour which has resulted in some great engagement and makes the feed look overall more polished. I don’t think it’s possible to determine as you can’t really have one without the other. A beautiful image is fantastic, but it’s irrelevant without solid content to frame the reasoning behind the post. Media representation is often scrutinised for exhibiting stock-standard conceptions of beauty and the ‘ideal image’. Has Ministry of Talent looked for ways to challenge and re-define this? We strongly believe in the individuality of our influencers, which is a big reason behind why we have such a diverse range of talent available for collaborations. I think the reality is that every brand and every person is going to have a different definition of what is the “ideal image” - our job is to marry up the need and brand with the right influencer in order to hit the right target audience. What are some key, memorable moments for Ministry of Talent? There are a few jobs that stand out particularly, working with brands such as Optus, Westfield and American Express just to name a few have been fantastic! However, the most satisfaction comes from the ongoing success of the business which continues to grow and flourish with our exceptional talent roster. What’s the plans to expand business next? THE MINISTRY OF TALENT is looking forward to an exciting 12 months, moving into our new headquarters in Paddington at the start of this year and expanding our talent offering even more through our bi-annual scouting tours where we travel around Australia looking for the best digital talent that Australia has to offer. Check out MINISTRY OF TALENT here.